I have my station set up on a "U" shaped desk. As you can see, I operate my radios' with my left hand and my keyboard or bencher paddles with my right hand. Notice Scott's (N3FJP) software on the screen. This is the BEST contesting and general software on the market today. 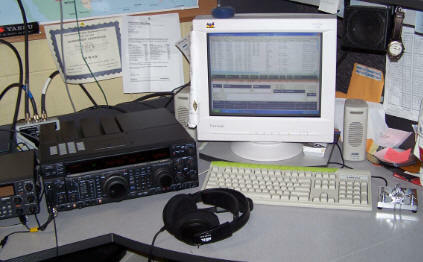 For more information, visit www.n3fjp.com The two antenna switches behind the radios let me switch between the two radios and the two Gap verticals.